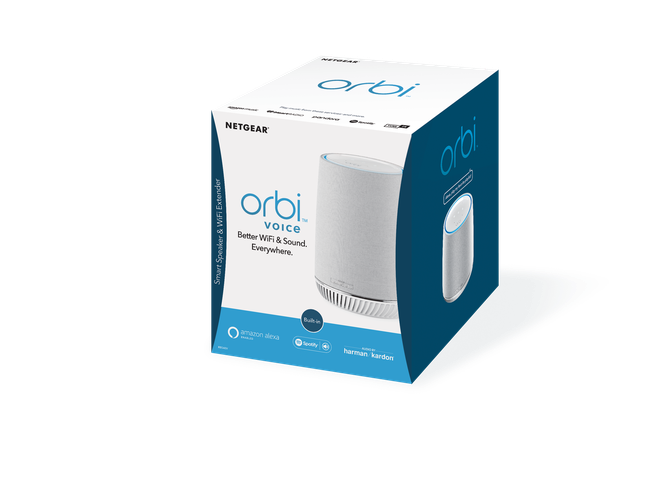 Netgear is set to expand into the smart speaker space with the new Orbi Voice. According to the company, "Orbi Voice is a smart speaker that extends your existing WiFi to any room. It has Amazon Alexa built in so you can voice control your music and other smart home devices. High performance tri-band Mesh WiFi extends your existing WiFi by up to 2,000 square feet so you have better Wi-Fi in more places." The Orbi Voice is an AC2200 tri-band mesh Wi-Fi system that touts beam-forming across both the 2.4Ghz and 5GHz bands plus a set of four high performance antennas with high-powered amplifiers. It can bought and set up on its own, or integrated with any of the previous Orbi systems. It's also MU-MIMO capable and features two Gigabit Ethernet ports. Essentially, the Orbi Voice is a refresh of the the existing RBK50 Orbi spliced with an Amazon Echo and a Harman Kardon speaker. From the outset, the pitch is very similar to that of the ASUS Lyra Voice. The unit itself boasts four far-field microphones, a 1-inch front-facing tweeter and a 3.5-inch front-facing woofer. All told, the Orbi Voice boasts 35W of total power. Again, it comes with on-board Alexa - so you can use it just as you would the Echo, Echo Dot and Echo Plus. Netgear couldn't give us specific retail availability but we expect to be available in JB Hi-Fi and Harvey Norman, as both currently stock the rest of Netgear's Orbi hardware. The Orbi Voice will be available later this year, priced at AU$599 for a single and AU$899 for a double-pack.